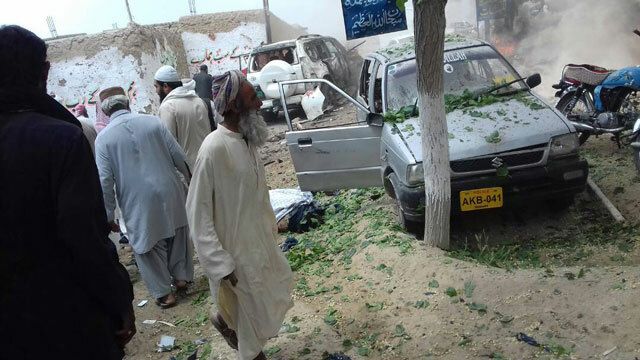 QUETTA: A suicide bomb blast targeting the convoy of a senior politician in Balochistan on Friday killed 26 people and wounded 30 others — some of them critically — shattering a relative calm that has prevailed in recent weeks in the province. The blast in the town of Mastung, about 50km from the provincial capital, struck a vehicle carrying Senate Deputy Chairman Maulana Abdul Ghafoor Haideri, shortly after Friday prayers. The Jamiat Ulema-e-Islam-Fazl (JUI-F) secretary-general escaped the attack with light wounds, medics said, but his driver and another aide in the same vehicle were killed. The attack was later claimed by the Islamic State group. The group’s Amaq news agency said a bomber wearing an explosive vest was responsible for the attack. However, why the top JUI-F leader was targeted was not explained. The convoy was targeted at the Quetta-Karachi National Highway when Maulana Haideri was returning from a seminary after attending a certificate distribution ceremony. 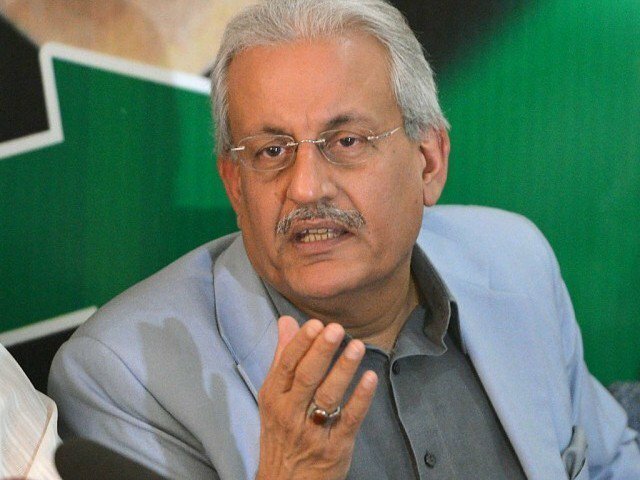 The JUI-F is a junior coalition partner of the PML-N government at the centre and sits in the opposition in Balochistan. DPO Mastung Ghazanfar Ali said initial probe suggested that it was a suicide attack. “A suspected suicide–bomber hit Maulana Haideri’s car,” he said. However, another police official said the nature of the blast could not be ascertained immediately. “It is not yet clear whether it was a planted bomb or a suicide attack,” Safar Khan said. Commissioner Kalat Division Hashim Khan Ghilzai also confirmed that it was a suicide attack on the JUI-F motorcade in Mastung. Maulana Hafiz Qudratullah, Naib Amir, JUI-F Quetta district; deputy chairman’s staff officer Iftikhar Mughal, driver, a police officer and many party workers, who were travelling as part of the convoy, were among the dead. 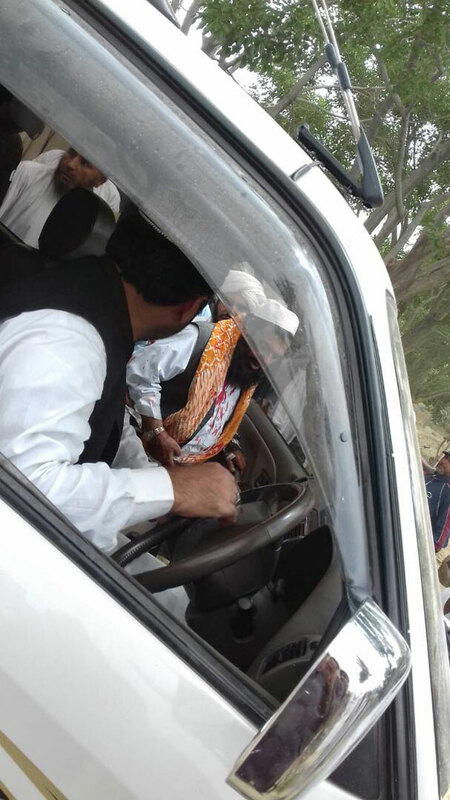 The bullet-proof vehicle in which Maulana Haideri was travelling was completely destroyed in the explosion. “The Maulana is safe and sound and shifted to CMH, Quetta,” Anwar-ul-Haq, the spokesman for Balochistan government said, adding he received minor injuries. Maulana Haideri was not in his car at the time of the attack. Hence, he only suffered minor injuries. One of his colleagues, Maulana Abdul Malik told a news channel that the Maulana left his own car and joined his friends in another car owned by his friend. That was why he escaped the suicide attack. Eyewitness accounts said the blast took place when Maulana Haideri was moving towards the place in his vehicle where a luncheon was arranged for the guests who were invited to attend the ceremony. “All of a sudden a huge blast took place near the vehicle in which the Senate deputy chairman was sitting,” Sardar Noor, who also received injuries, said. Official sources said Maulana Haideri was invited by the administration of the religious seminary. He distributed certificates among the students and performed their distar bandi. He also offered Friday prayers in the seminary’s mosque and after that he was going for lunch outside of the seminary when the powerful explosion took place near his vehicle. Soon after the blast security forces rushed to the site along with rescue workers who started shifting the injured and bodies to the district hospital and Nawab Ghous Bakhsh Raisani Memorial Hospital Mastung. “Both the hospitals received 26 bodies and 30 injured,” Sher Ahmed Satakza, District Health Officer Mastung confirmed, adding the death toll could rise as the condition of at last 10 injured was serious who were shifted to the Trauma Centre of the Civil Hospital Quetta. Hospital sources said after initial treatment, Maulana Haideri was shifted to the Combined Military Hospital, Quetta along with three other injured. The bomb disposal squad reached the blast site and after collecting evidence confirmed that it was a suicide attack. “Around 12kg of explosives material was used,” a senior police officer said. The police have collected limbs and body parts of many people from the blast scene. Levies officials cordoned off the entire area and began a search operation for the collaborators and facilitators of the suicide bomber. Emergency has been declared at hospitals in Mastung and Quetta. Taking notice of the incident, Balochistan Chief Minister Nawab Sanaullah Zehri directed the authorities concerned to submit a detailed report. Meanwhile, Prime Minister Nawaz Sharif, Interior Minister Chaudhry Nisar Ali Khan and Minister of State for Information, Broadcasting and National Heritage Marriyum Aurangzeb condemned the dastardly attack. Also, JUI-F chief Maulana Fazlur Rehman postponed his visit to Quetta scheduled for May 14, an announcement said. The party’s Balochistan chapter has also announced a shutter-down strike across the province on Saturday to protest the suicide attack. Speaking at a news conference late Friday night, party’s provincial general secretary Sikander Khan Advocate said the assault was carried out under a well-planed conspiracy. He appealed to all political parties and traders’ organisations to support the strike call and make it successful.